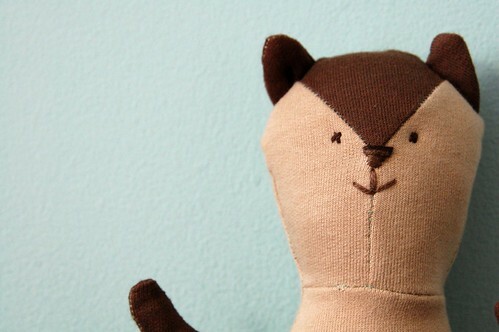 This little chipmunk guy was made back in April in the Animal Softies class taught by pupa pupa designer, D’Andrea. In this class, D’Andrea helps each student design, draft a pattern and create a softie from their imagination out of the softest french terry stuffed with wool from a local farm. 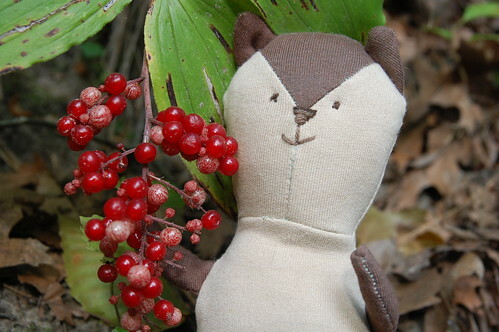 I had originally wanted to make a squirrel softie, but then I saw this adorable chipmunk photo and changed my mind. Can you see the resemblance? I couldn’t decide whether or not to make him an outfit – a little vest? or bowtie? 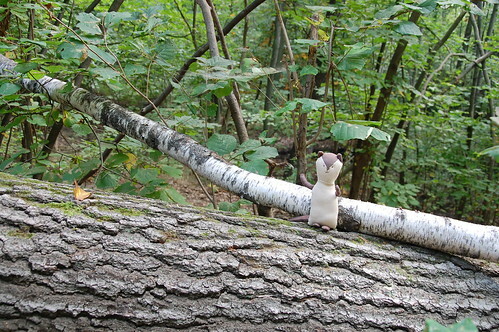 and before I knew it, he had scampered off into the woods for the summer. Designing something with a personality is challenging, I felt much more critical of my work than when I’m making a piece of clothing. I miscalculated seam allowances and worried about his tiny little limbs. I thought he looked nothing like a chipmunk and jealously eyed my class mates’ cuter creations. I think we all have this dialogue with ourselves when we’re creating. As often as possible, I look at ‘mistakes’ as opportunities to be extra creative or to learn what not to do next time. I know that I find this easier to do when I’m making clothing, since I have so much practice making mistakes and fixing them there. It can be especially hard when you are learning something to allow yourself the freedom switch off the expectations and focus on exploring the process. The process was actually really fun. From a photo (loosely), I had drafted a pattern and created a three dimensional little animal, something I had never attempted before. Not bad. As I was stitching on his face (feeling subpar about my embroidery skills), Chuck looked up at me with his funny smile and I saw how sweet and wonky and perfect he was. 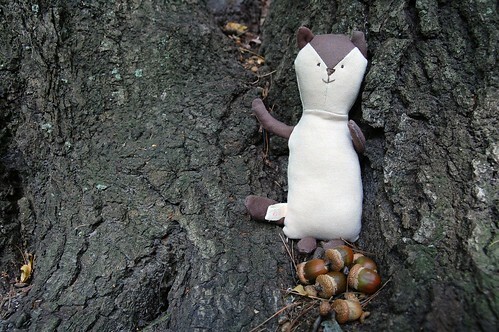 With fall approaching, Chuck has been gathering acorns and berries in the woods and enjoying afternoon naps in soft mossy patches before the cold weather sets in. It’s a pretty good life for a chipmunk. Chuck, I am nuts about you. aw chuck is adorable! i think a necktie or bowtie will be awesome, very a la chuck from gg. yup, this post totally made my day. He is so cute and funny. I like him a whole lot. 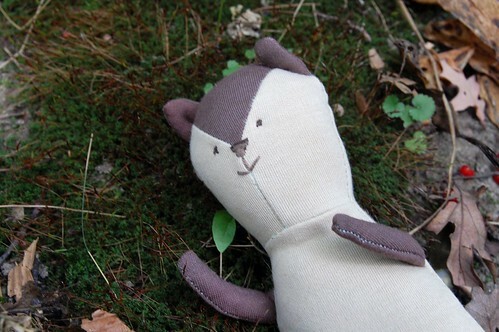 I love the picture of him lounging on the bed of moss – so sweet. OMG – Chuck is fantastic! He is perfect and looks to be quite the productive gatherer. Do you foresee Chuck having a family in the future? Or is he more of a bachelor kind of chipmunk? I think his offspring would be quite cute. Or, or, or maybe Chuck and Perfect Bunny will become fast friends and have heaps of adventures that can be documented on your blog. aww, your chipmunk is just gorgeous! 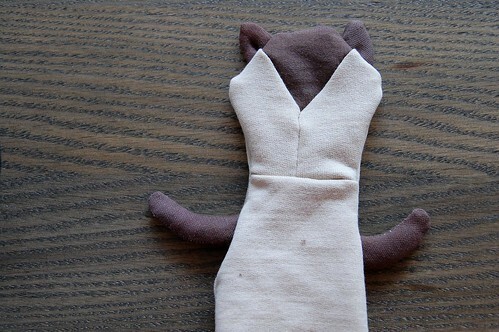 i think i little vest will look cute. I love him so much. Your pictures are absolutely adorable!